Whether it’s those chilly winter evenings, a get together with friends to cherish the magic of spring, or simply those pretty moonlit nights of soothing weathers, everything can become so much more gorgeous when you have got a warm fire pit to sit around. And to make that happen, below are 20 unconventional fire pit ideas that will make your yard a to-look-out-for corner of your space. A fire pit that serves as a reminder that you must spend some quality-time in the yard every time you get a glimpse of it. A store-bought pit is employed inside a round-shaped assembly of rustic bricks that is further surrounded by another brick-paved seating area on the garden. Place a few wooden chairs on the bricked surface that separates the rest of the yard with the seating, throw in some cozy cushions on the chairs, lastly, decorating the same the section with some lovely planters. This inspiration goes for a variety of planters including galvanised containers, wooden ones, terra cotta pots and more. The final glamour comes into action by the addition of bright golden lights over the whole section, hanging in mid-air with the help of wooden dowels inserted into the ground. The title itself here is enough to raise all that curiosity as to how you can actually build a whole firepit in the yard right from the very scratch – without even spending any more than 60 dollars. Plus, the minimalist end results this idea shared by Bedding Comforter Sets yields is an equally significant factor. The tutorial guides you through each of the steps needed to work up the firepit all by yourself with the help of detailed visuals instructions. The building blocks for the structure are rustic-looking bricks in a lovely rectangular shape with one of the edges slightly curved, and you have got to lay the bricks on the yard in a way that a number of ring-like layers stack on top of each other. Additionally, the bottom of the pit is also lined with thin fine rectangular bricks. Who needs to have a glorious firepit limited to the yard alone when you can carry it along to a picnic in the most convenient ways ever? Have the bunch of friends or the whole family relax around the fire while you keep the pit on the ground or even a table, cherishing the beauty of nature around without worrying about the chilly winds of winter. However, the best part here is that this one is actually a thing of clever repurposing that puts an old washing machine drum to new use, transforming it into the DIY pit with just a few simple steps of construction. 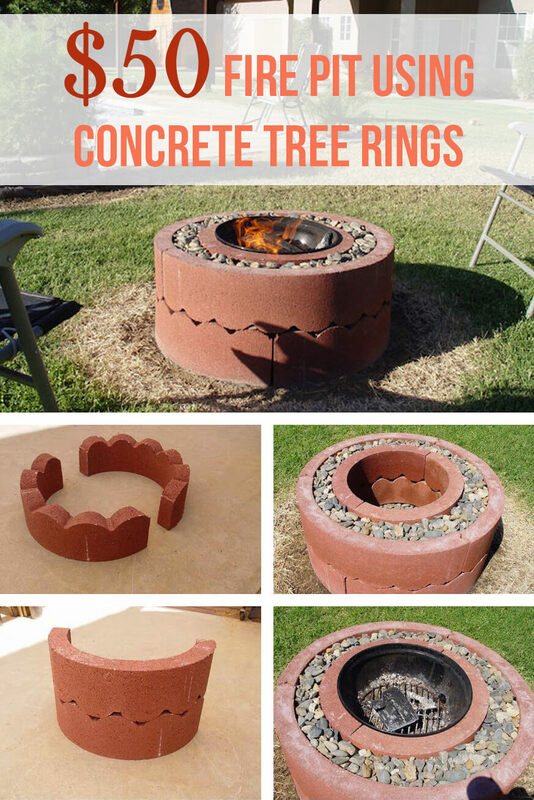 Surely, one of the coolest and the most easy to make firepit out there that can give any store-bought one a good run for its money. Here’s another circular fire pit that is built entirely using tree rings, sporting the ability to fit into just about any backyard setting. Plus, the compact size of the structure makes sure you have got ample room for plenty of friends and family to gather around it. Not only is this one beautifully earthy, but also very easy to construct by laying the blocks in place one-by-one. Two eccentric rings are worked up in the yard, wherein the space between the two rings is loaded with different-sized stones throughout, while the inner circle works as the spot for the actual metal fire pit installation. Check out the image shared by Bedding Comforter Sets to learn the steps you need to follow to forge the project. Must mention, the whole construction costs no more than 50 dollars. The ultimate showstopper of this DIY backyard firepit is those swing seats hanging to the metal frame worked up around the pit with the help of chains. The simple, super functional and oh so budget-friendly setup is a must-have for all those who would love to spend those lovely evenings with the family outside, cherishing a nice cup of beverage. Once the frame for hanging the swings is worked up with rectangular pieces of wood and dowels, it is spray painted in deep black to complement the natural weathered texture and grey hue of the bricks that are used to build the firepit in the middle. To differentiate the remaining yard with the firepit area, a large circular disc around the pit is lined with fine gravel, and it’s done! You surely won’t find anything easier on the list than this inspiration shared by Roomodeling that simply assembles the different elements together instead of building a firepit from scratch. Yet, everything is done while keeping it all surprisingly pocket-friendly. I just love how the whole work is done using a store-bought metal firepit with built-in stands that leave enough room underneath the pit, accompanying it by thick wooden logs on four sides. Instead of working up the setup on the garden bed, this one goes for a bed of gravel and small stones on one corner of the garden to get it all done. Simply throw in pieces of wood and tree trunk pieces inside the pit and you are all ready to set them on fire. For an extra touch of decoration, adding a few terra cotta pots or planters near the pit is a great idea. Not just any ordinary fire pit, this one is actually a complete backyard makeover that builds a whole seating area around the pit, further lining the area with a one-of-a-kind arc-like table that’s made out of more bricks and stones. 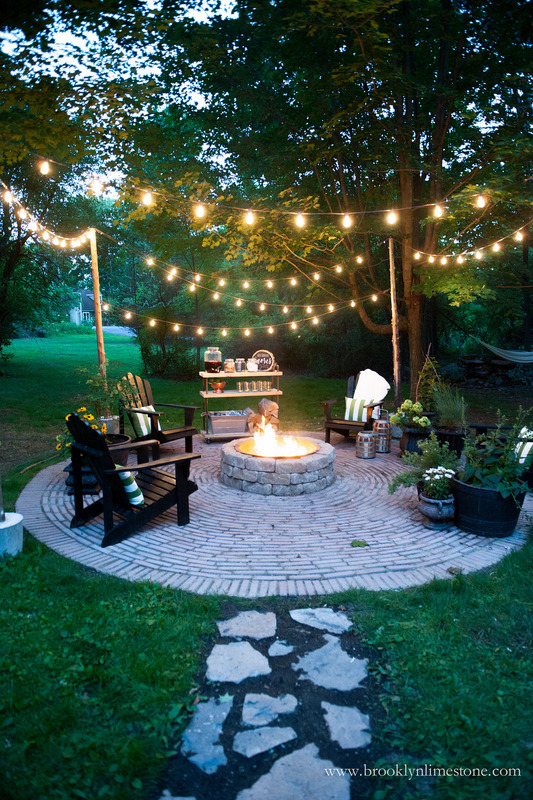 The great spot to gather is more like a unique patio that features a fire pit as its focal point. A variety of stonework goes into the making of the patio, wherein square bricks are shaped up together to form the circular fire pit, throwing in smaller stones inside. The same bricks are used to build the curve-like tabletop that’s further adorned with large marble tiles in a rustic appeal. Choose another geometrical stone tiles for the floor of the patio area, and voila! Last but not the least, add a bunch of wicker chairs or ottomans to make for some comfy seating. White totally owns this patio that is marked by a breathtakingly beautiful firepit in a lovely rectangular shape. What the pit is covered with from all the sides is glorious white marble tiles, and the sleek cavity inside the same is filled with stones. The rustic farmhouse-like wooden flooring goes with the firepit magically well, taking things to all new levels of awesomeness with a super huge L-shaped seating placed around the pit. The seating platform is lined with comfortable mattresses that come in milky white, while lots of cushions and throw pillows in the same white fabric cover work as the cherry on the cake for this inspiration. The overall look flaunted by the arrangement is absolutely regal, having the marble and shades of white dominate the scene at their best. Build a gorgeous round patio in the middle of your yard by paving the ground with beautiful stones and marbles. The special part about this patio base here is that each of the tiles building the ground feature a different shape of its own. Plus, the intended imperfections and varied hues of the bricks that form the sides of the firepit work as the perfect extension of the patio floor. Finally, the top surface is finished up with fine curved marble tiles. While some low-height marble pillars make the scene even more rich in this idea by Roomodeling, you can always go for a minimalist construction. To make the area ready to spend an evening, throw in a few large, cosy comfy chairs side tables into the picture. The pastel hues of the upholstery on the chairs goes just right with their brown-black built.